I was recently looking at some binary clocks and I felt like Why not? I have everything to make one and I don’t have a clock in my room. So I decided to build one and here it is. Hope you Like it and maybe build your own. It’s a cool project because it’s your very own, unique clock, it’s easy to make, it’s highly customizable in both size/shape and firmware/functions, it is Arduino based/compatible AND it looks good. (if not using an Arduino) 16Mhz crystal and caps (the more precise, the better). Computer (I guess you have one if you’re reading this). (if not using an Arduino) USBtiny ISP. The easiest and simplest enclosure is a cardboard box, you could also use a nicer plastic or wooden box, it’s up to you. Select your box, remove the back part from it. if it’s a cardboard box, you might want to disassemble it and reassemble it inside out, like I did, that way its easier to paint or, leave it like that and it looks great! Step 3: Mark your box. You need a 4×4 grid, but don’t make holes just yet, as you won’t fill it all the way. in a cardboard box, I four it’s easier to just make some small holes for the LED legs and insert them from the outside, other ways the cardboard will look awful and your LEDs won’t be “snapped to grid”. At first, I marked my box on the inside, but later on I decided that I actuallly liked those Grid lines, so I did them on the outside too. 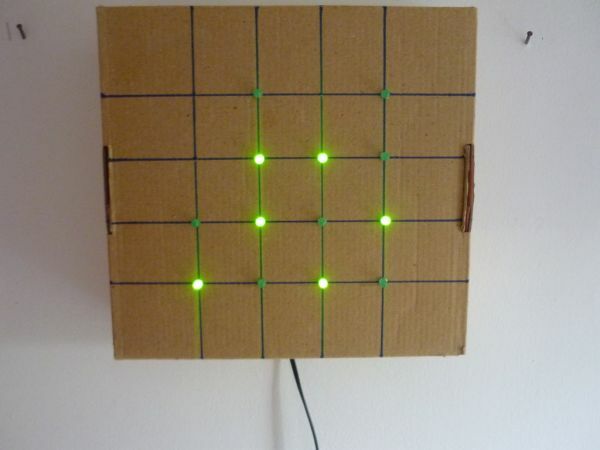 Place your 13 LEDs in your 4×4 grid as shown in the image above. from the inside, Bend all the Leads and place a drop of hot melt glue on top of each (Bottom, actually) (see image 2). connect together all the POSITIVE leads (the longer ones) from each LED. Add one wire to each LED’s NEGATIVE lead. instead of the positive lead, connect the NEGATIVE ones, contrary to the diagram above. Remember, all the POSITIVE ones are connected together, contrary to what the diagram shows. 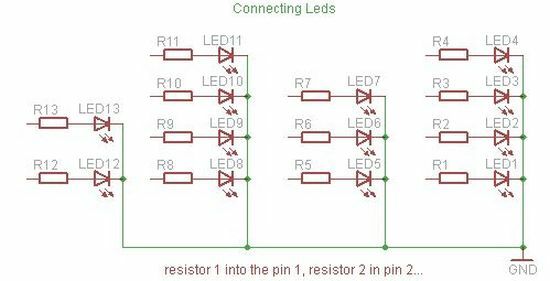 simply add one resistor to each wire going to each LEDs leads and connect them to the corresponding arduino pins, then connect a pushbutton to Arduino’s digital pin 14 (Analog 0), one to digital pin 18 (analog 4) and another to digital pin 19 (analog 5). the 14 pushbutton will change minutes, adding one for each time you press it. the 19 pushbutton will change hours, adding one for each time you press it. the 18 LDR (optional, instead of the pushbutton) will turn the LEDs when ther’s no light, e.g. at night. but keep them on when there is, like in the day or at night, when you turn on the lights. the proper LED to Arduino pin diagram is shown below, remember that it´s the other way around, instead of all to Gnd, all to 5V, etc.